Have you heard of Olaplex? If not, I'm not entirely surprised, it seems that it has been a hairdresser secret for a long time. 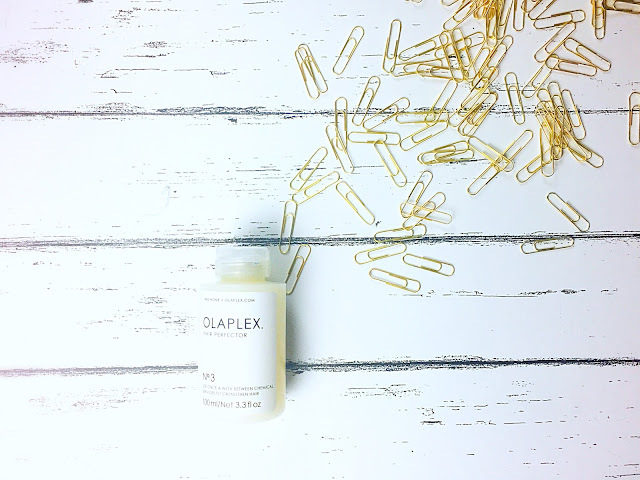 Olaplex's formula is a system which permanently rebuilds the damaged disulphide bonds in your hair that are broken during the chemical process, i.e. dying and bleaching. If you have over-bleached then olaplex rebuilds strength, structure and integrity. The olaplex series allows colourists to take hair from black to blonde instantly with minimal damage, HOW AMAZING. Stupidly, I have been every hair colour under the sun, you name it, I've been it, brown, red, purple, plum, black, highlighted, ombre, blonde, dark brown and now back to blonde. My hair has had its fair share of damage to say the very least. Olaplex is a salon treatment which from memory costs around £25 a go so when I discovered I could do this treatment at home and have a whole bottle of it for just £21 I thought I should give it a go. I simply used this as a way of managing not only the appearance of my hair but its condition as I recently decided yet again to go lighter. I have noticed such a drastic change in the strength of my hair and I have been using this every week as a masque like treatment simply by applying it thoroughly through my hair from roots to end and then leave it on for around 1 hour however this treatment is recommended to use for around 20 minutes but I love to keep it in for around an hour to really let it soak in. Kim Kardashian loves this product and she uses it in her hair over night which makes the results even more visible! I definitely need to try using it overnight to see the difference that may have although I'm more than pleased with the results I have currently. But this product is not just for blondes, this is a great way to really restore dry and unruly hair to ensure split ends are bonded together to prevent breakage and therefore leaving healthier and stronger hair at the roots and ends!! Notino.co.uk have this amazing hair treatment for just £21 which I think is fab considering for one treatment in a salon you would be paying upward for £25 so now you can have multiple treatments for a fraction of the price.